Evangeline finally got what she longed for – the cursed pendant off her neck and Caden in her arms - only it has come at a steep price. An unknown poison now courses through her body, slowly morphing her into something no one but the Fates can foresee. She has her suspicions though...and, if she is right, it will spell certain ruin for her and Caden. She won’t last long enough to realize that though, if Viggo and Mortimer uncover the treasonous secrets she keeps from them– that Veronique is now free of her entombment and in the torturous clutches of the Witches and the Sentinel or that she is protecting a Sentinel within their very midst. Always the naive human caught in the midst of the vampires’ web of deceit, Evangeline is now weaving her own dangerous web in order to keep her friend alive, rescue Veronique, and stop a seemingly inevitable war from starting. But can her honourable nature handle the depths of duplicity for which she must go to be in league with the Vampires? Dark and gripping, full of angst-riddled scenes, Allegiance will have readers anxiously turning pages to find out if Evangeline can survive this spiralling disaster. The Casual Enchantment Series is three stories along and getting gloomier and gloomier. At this pace it seems as though K.A. Tucker just doesn't want to give Evangeline a happy ending. Evangeline is still denied her desire for a forever with Caden even though she found a way around certain death from the cursed necklace, gifted by the witch-vampire Sofie. Sofie's sister has been unlocked from her frozen state, but no one but Evangeline knows. Julian's big secret puts Evangeline in a tight spot with Caden and Amelie. To top it all off, the witches and Sentinel have taken over Viggo and Mortimer's New York residence, leaving the strong, jolly vampire Bishop broken and without his mate. 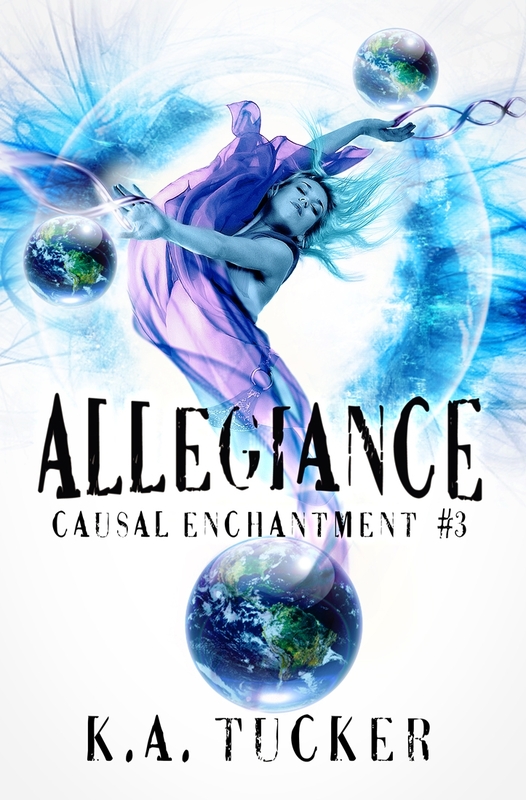 Allegiance continues Evangeline's story, alternating chapters with Sofie, as their world comes closer to mirroring the demise of Ratheus. Evangeline is no longer the sweet, naive girl I admired from Anathema. She's become a childish liar with a troublesome attitude. She focuses on everything wrong that's happening or might come to happen, which adds to the gloomy tone of the novel. Evangeline is at the center of the plot, but she doesn't handle anything. I'd have much more respect for this new version of Evangeline is she stepped up and actually did something that helped her friends out of their bad situation. All the characters turn to Sofie to work her magic. Sofie's Casual Enchantments are the reason everything has turned out so wrongly in the first place. But of course, it's the fault of the Fates for why her spells don't end up the way they should. I didn't really like the characterization, mostly Evangeline's, and the direction of the plot, since Anathema and Asylum, is not what I expected. I would still recommend Allegiance because Tucker is a very original author. 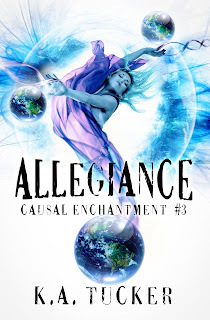 I have yet to see anything similar to the Casual Enchantment series and must give kudos! New to the Casual Enchantment Series? Get your free copy of the first book in the series, ANATHEMA, free!